Tazebao | Officina In s.r.l. A colourful alphabet of forms, designs, materials to use freely in order to design a space able to change together with whom inhabits it. Tazebao by Calabrese – Koster – Meliota is the ideal solution for the kids’ night area: a large solution with elements designed as harmonic marks to create free, original and cosy compositions. Available in 40 matt lacquered colours of Lema’s collection, to satisfy any aesthetic and functional need, in the name of the utmost customisation. Tazebao consists of beds, shelves, desks. The bed is available in 40 possible combinations in bunk, cabin or sofa version, with fixed or liftable mesh with storage unit or alternatively, with extractable bed with timed motion. Around the beds, benches and bedside tables with or without wheels can be equipped with drawers, and day elements, all proposed in different sizes. According to Lema’s philosophy, a collections of desks proposed in various colours, shapes and sizes complete the bedroom. Available in several lengths, straight or shaped, free-standing or integrated to Selecta bookcases, also with underlying drawers. 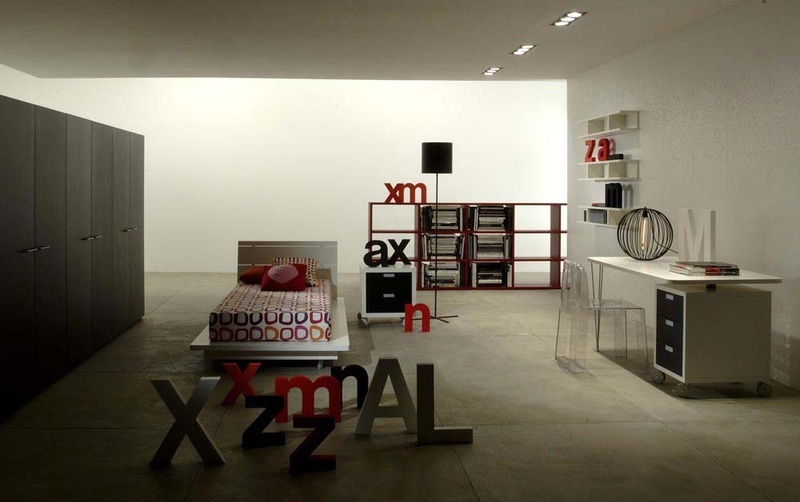 Besides them, Quadri represent one of the most distinctive elements of the entire program: ready-to-use elements to be fixed to the wall, consisting of a large panel that can be equipped with shelves or linear and shaped desks, embellished with accessories dedicated to containing CDs. For maximum durability and safety, Tazebao collection, as well as all Lema’s products, are made using NON-TOXIC and U.V. polyurethane paints at low dry residues, as established by the children toys safety directive (EN 71/3). Metal parts are supplied in an elegant aluminium finishing, which is made of polyurethane and wear resistance paints. All upholstered beds have textile parts with removable covering.